Day 4 in 1770... Feels wierd to be in one place for three nights. 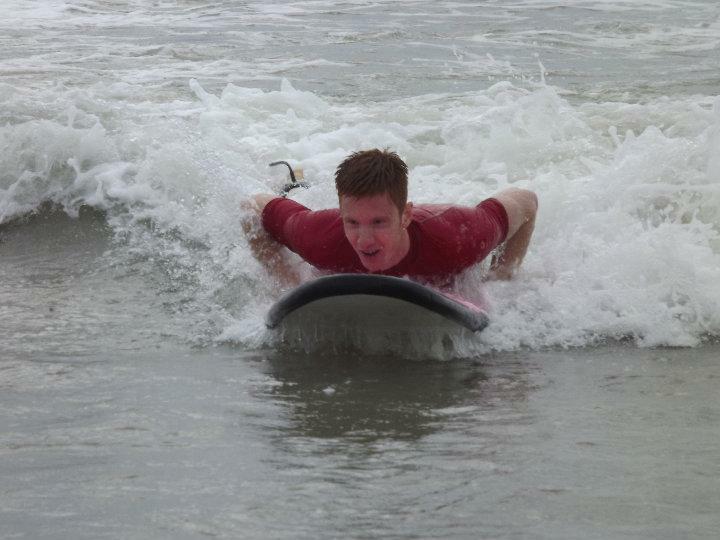 But today I finally got around to take a surfing lesson, 17$ for 3 hour. Best deal in australia. Anyways, as always with stuff like that, the instructor went through the basics and what to think about for a while, how to get onto the board, how to stay on it and how to look good while falling off. The weather wasn't great, it was cloudy and almost chilly. The instructor actually started scaring us up by telling us that the water had dropped a few degrees but "..most of you are from Europe, so you should have no problem"
We didn't get ful wetsuits, but we did get these fancy red shirts that you see in the picture. As soon as you felt the water though you realized that he was only spoiled. Didnt feel cold the least for the full 2 hours we spend on the waves. It was really fun and there was a guy taking pictures of us all the time that we could buy for $5 after. Hung around for a while with a few of the people I met there, none of them going on the same way I am though. Got back to the hostel, cleaned up and just got everything in order, don't know when I'll get wifi the next time so better fix everything now. Next time I get in touch will most likely be from magnetic island.